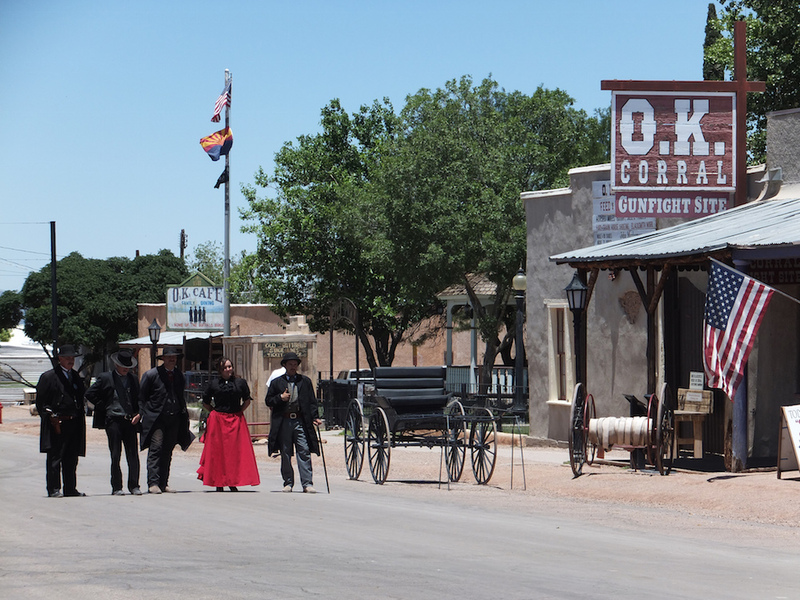 On October 26, 1881, nine armed men faced one another in a vacant lot near a livery stable in the silver-mining boomtown of Tombstone, Arizona. Four sworn officers intended to arrest a handful of civilians who were carrying guns within city limits without a permit. The officers were the brothers Wyatt, Morgan, and Virgil Earp, along with their friend John “Doc” Holliday. The wanted civilians were Ike and Billy Clanton, Tom and Frank McLaury, and Billy Claiborne. Almost without warning, the misdemeanor arrest went wrong. Thirty seconds and 30 bullets later, three civilians were dead and three officers were wounded. For over 130 years, that half-minute street fight has been central to what Americans believe about frontier justice in the Old West. Quickly dubbed “the gunfight at the O.K. Corral,” the shoot-out has been the climax of 30 feature films. It’s been the subject of radio plays, television series, PBS documentaries, and thousands of books, my own included. Why do we keep telling this story, decade after decade? Out of all the gun violence that took place on the frontier, why did those 30 seconds become so important? How did Wyatt Earp become the hero, when his brother Virgil was the officer in charge? How did Ike Clanton become the villain? How did a farmer like Tommy McLaury become an outlaw who deserved to die? When and why did myth-making take hold? As a novelist, I dig deep into the childhoods of the historical characters who populate my books because our first 14 years form the basis of everything that follows. We spend the rest of our lives building on a sound foundation of those years, or trying to repair their damage, or wandering in their wreckage. That deep research for Epitaph: A Novel of the O.K. Corral revealed how much the gunfight’s mythic hero and villain had in common. Wyatt Earp and Ike Clanton were the same age, born to fathers considered unusually brutal even when beating the devil out of children was normal. Ike spent his life wandering in the wreckage of his blighted childhood. Wyatt tried hard to repair the damage of his; he was not entirely successful. Both of them had younger brothers they felt responsible for, and they took pride in protecting those boys from their fathers’ wrath. Now consider this: Billy Clanton bled to death in Ike’s arms a few minutes after the Tombstone gunfight. Five months later, in a symmetry worthy of Shakespearean tragedy, Morgan Earp bled to death in Wyatt’s arms, shot in the back by Clanton partisans in retribution. Between those events, a respected judge cleared Doc Holliday and the three Earp brothers of wrongdoing in the death of Billy Clanton, and those of Frank and Tom McLaury. It was a carefully reasoned legal decision, but one that’s considered a miscarriage of justice by the Clanton and McLaury families to this day. What the gunfight movies don’t show is how Ike Clanton’s grief was exploited by those who feared a crackdown on crime should Wyatt Earp become sheriff in the next Cochise County election. What they don’t show is how Wyatt Earp’s grief was exploited by silver mining industrialists who saw their investments as jeopardized by the burgeoning criminal element of Cochise County, which operated in Arizona with impunity. These businessmen offered Wyatt a great deal money and promised him a pardon if he went after the outlaws and left them dead in the mesquite where alibis wouldn’t count. In the 96 hours after Morgan’s death, Wyatt Earp carried out five extra-judicial executions. We don’t know if he accepted money for what he did, but even the attempt to hire him as a contract killer is evidence that everyone—Ike, the respectable businessmen of Tombstone, the Cochise County judges, and Wyatt himself—everyone had lost faith in the legal system’s ability to do justice. And that, I believe, is why we keep telling this story. For thousands of years, we’ve loved revenge dramas, which are all about holding someone responsible for a crime that has gone unpunished. The Iliad, Hamlet, The Godfather, and Tombstone are all revenge dramas. Crimes are committed in the first act. In the second act, the perpetrators seem to be getting away with it. In the third act, they are punished when heroes exact bloody revenge. The hero holds someone responsible, inflicts retribution, and punishes the wrongdoer. The hero is allowed to become detective, judge, jury, and executioner because the justice system appears to have failed. So, if you’re going to admire Wyatt Earp for avenging Morgan’s death, you should forgive Ike Clanton for avenging Billy. A brother was killed. Justice was denied. Revenge was exacted. Of course, nobody thinks Ike Clanton is a hero now, but neither was Wyatt until after World War I. In the 1920s, families grieved for a generation of young men killed by the thousands in a matter of minutes by machine guns, artillery, and mustard gas. A terrible wrong had been perpetrated, but nobody could be held responsible for millions of wrenching losses. In the aftermath of all that death, the public was hungry for stories of individual heroism in human-sized dramas. In Britain, this led to the lionizing of Lawrence of Arabia; in America, this hunger for heroes coincided with the early days of the motion picture industry. People were already nostalgic about the frontier and William S. Hart became an international star by playing the same role in dozens of short cowboy movies. He was a good bad man. A man who did bad things for good reasons. In 1927, Walter Noble Burns published a fictionalized account of the gunfight at the O.K. Corral that was a bestseller. This was before novels were identified as such on their covers and many believed that Tombstone: An Iliad of the Southwest was history, not fiction. In this account, Wyatt Earp was a good man who did bad things for good reasons, while the Clantons and McLaurys were simple bad guys. Five years later, Stuart Lake published the biography Wyatt Earp: Frontier Marshal. This was a rigorously sanitized version of Wyatt’s life, minutely supervised by his widow, Josephine Marcus Earp. At her insistence, Lake created a virtuous and just Wyatt Earp who fought the Clanton gang in Tombstone just like Elliot Ness faced down Al Capone’s gangsters in Chicago. This 1927 version of the gunfight has become the basis of many movies and in 1955, Stuart Lake’s Frontier Marshal was adapted for the television series, The Life and Legend of Wyatt Earp. On screen, Wyatt became the man his wife wanted us to remember: a flawless hero of the lawless West, “brave, courageous and bold.” Straightforward “good guy vs. bad guy” Westerns remained popular well into the 1960s. Moral ambiguity began to sneak into the genre with The Man Who Shot Liberty Valance and The Ox-Bow Incident. Then, during the Vietnam War, moral ambiguity became the norm. Westerns—and heroes in general—fell out fashion. Nevertheless, fascination with the gunfight at the O.K. Corral endures because revenge dramas remain so emotionally satisfying. They lift an ordinary individual out of the ordinariness of life. Responsibilities and petty annoyances are swept aside by a clear purpose. Even the score. Settle this, once and for all. For all the noise about gun rights and our culture’s glorification of violence, it is heartening, then, that people so rarely seek retribution in real life, even when they have just cause by the standards of Wyatt and Ike. Like the McLaurys, those bereaved by violence almost always accept the rule of law, even when they are bitterly disappointed by the findings of a court. They often pour their grief into political action and social reform. I for one honor their restraint and dignity in the face of shattering loss. Wyatt Earp’s story makes a better drama; theirs makes a better world. 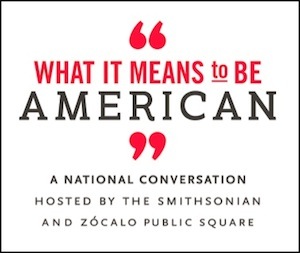 Mary Doria Russell is the award-winning author of six critically acclaimed bestsellers including The Sparrow, A Thread of Grace, Doc, and Epitaph.She wrote this for What It Means to Be American, a partnership of the Smithsonian and Zócalo Public Square. *Photo courtesy of Aidan Wakely-Mulroney.